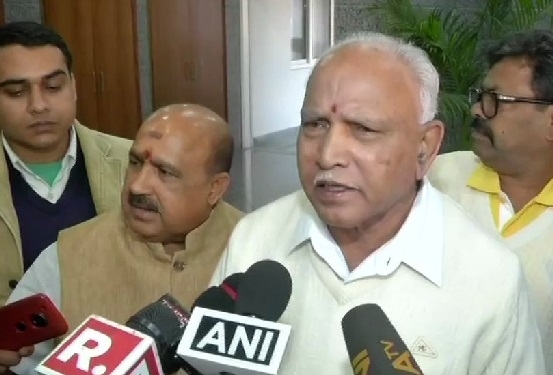 New Delhi, Jan 14: Former Karnataka Chief Minister BS Yeddyurappa today accused Chief Minister HD Kumaraswamy of poaching BJP lawmaker. Speaking to the media here, the state BJP Chief said that the principal opposition party is not involved in any kind of “horse-trading” as claimed by the leaders of Congress-JD(S) government. Yeddyurappa went on saying that Kumaraswamy is misusing the office of the Chief Minister to lure BJP lawmakers. He further added that BJP with insufficient number can’t form the government. Earlier, senior Congress leader and Karnataka Water Resources Minister DK Shivakumar alleged that BJP in a bid to destabilize Congress government is making all efforts to trap Congress leaders. On the other hand, Deputy Karnataka CM G Parameshwara stated that Congress lawmakers will not pay heed to BJP’s malicious agenda.